I just found your website and it’s great! Thank you for being such a great help to us in need. just after few days he started biting,nipping hands, feet, arms, legs,furniture and now i dont know what to do i have tried everything. Hopefully that helps. Good luck training your puppy! I’m sorry to hear about your Lab cross. Here are a few things we’ve done with our puppies in the past. 1. We’ve had puppies that did not like the car. A few things that we’ve tried that have worked are. Taking them for short rides just through the neighborhood and increasing the time they spend in the car in small increments. Also, we’ve tried taking our pups only to places they enjoy so they think that car rides are always fun. 4. When our pups jump up we shorten up our leash and stand on it until they stop. As soon as they stop we reward and praise. 5. Every dog is different regarding treats. Some treats don’t work well with aggressive chewers. 6. When we eat meals our pups are always in a down-stay under the table. We start off teaching this by keeping our pups on leash and if they’re trying to come up to the table we shorten up and stand on the least. 7. Puppies need consistency and routines. When my fiance and I train our puppies we make sure and do everything exactly the same otherwise our puppies are confused and do not understand what is okay and not okay to do. 8. Linus has had some separation anxiety similar to what you’ve mentioned about Destiny when your partner went into the grocery store. One thing we’ve tried is using a thundershirt to help anxiety. While it is meant for dogs with anxiety with loud noises it has worked to a small degree with Linus when he has any kind of anxiety. I’d also mention that we’ve heard mixed reviews on the product some say they’ve had great success while others say that it hasn’t helped at all. If you haven’t had a chance you might want to read this one too: https://puppyintraining.com/3-traits-of-successful-puppy-raisers-and-bloggers/ You can ignore the part about bloggers, but the puppy part is very relevant. Hopefully that helps. Good luck with your training! When should I introduce puppy’s to food? I took one cup of puppy food and let in soak overnight with water and I am wondering if that is ok to introduce to puppies. When/how should I start potty training puppies. When I do give puppies food, what should I give them? Dry, or wet. Any adobe anyone had about maintaning a litter and a nursing mom would b greatly appreciated… Please no rude comments, that will not help me in keeping these puppies healthy… Thank you so much.. And please forgive my ignorance. Congratulations on your litter of puppies! Unfortunately, you’ve come to the wrong place as I’ve never whelped a litter of pups. I have had puppies as young as 4-5 weeks, but they were rescued from the shelter without mom. I was instructed to feed these puppies kibble soaked in warm water for 5-10 minutes. It was basically a mush after soaking. In general I receive puppies from Guide or Service Dog organizations when the pups are 7-8 weeks old. At that time I begin the puppy’s potty training. Hopefully that helps. Good luck with your puppies! Hi, I am trying to figure out why my 4 month old boxer is peeing on her big comfy pillow. She has been toilet trained for almost 2 months. She is also crate trained. Because she wants to sit on the couch with us, we decided to get her a big comfy cushion to sit on beside us. It looked big an d soft when we purchased it but found that it was flat when she sat on it after we brought it home so we put some extra fillers in it and she loves it. I pretty well know her routine which is out fist thing from the crate for both businesses and then eat…..about 10 mins later out again. This is the second time she has come in after doing her business the second time and walked over to her cushion and did a big pee on it……What could be going on. I understood that a dog does not like to mess in or on the same place they sleep…..so what could it be? Also, there’s a good chance that your puppy can still smell the urine in the pillow she’s peeing on. You might look into either replacing the pillow or cleaning it thoroughly with an enzymatic cleaner. Good luck with your training! Hi there….I’m Laura and this Wednesday I am going to a volunteer’s meeting at Leader Dogs for the Blind in Rochester, MI. I would like to volunteer in the puppy area; however, after watching your some 21 videos, I think I would absolutely LOVE to raise a puppy! I currently own a registered therapy dog and we volunteer at a local hospital twice a week, one hour per day. My other dog is his sister and I am going to get her tested through TDI, also. I am just so excited about this idea of raising a puppy in the right environment and knowing that the puppy will go toward someone in need, is of great benefit to me. 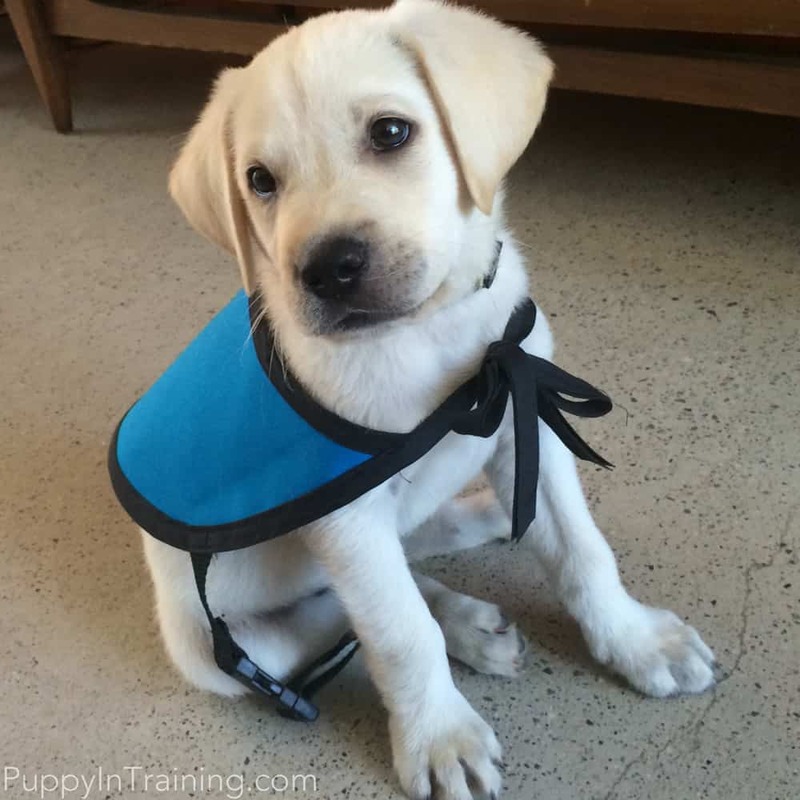 How long did it take you to get approved to become a puppy raiser? I know it will be different in all areas, but I was just curious. I’m thinking there has to be a home visit in order to get clearance, etc. Look forward to hearing from you! Thank you so much for your videos! I absolutely LOVE them! I’m so happy to hear that you enjoyed Dublin’s videos! Puppy raising is a life changing experience. I’m very excited for you and I hope you are able to raise a puppy for Leader Dogs for the Blind. Like you said each organization is a little different with their puppy raising programs. 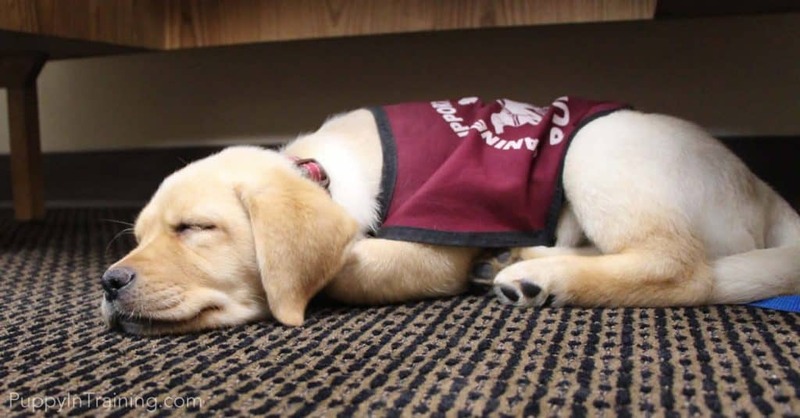 How long did it take to get approved to become a puppy raiser? It’s been a while since I first applied to become a puppy raiser, but if memory serves me I applied in October 2006, in January 2007 I was approved, and in February 2007 I received my first guide dog puppy, Stetson! However, I’ve spoke with many puppy raisers at Guide Dogs of America(GDA) and the experience has been different for everyone. It took some of our puppy raising friends over a year to receive their first puppy. GDA has their own breeding program and sometimes they have a lot of puppies and new puppy raisers receive puppies in short time while other times they have very few puppies and it can take a while. GDA does have a home visit and interview before getting clearance as a puppy raiser. I am so happy to hear that Dublin’s videos have inspired you! 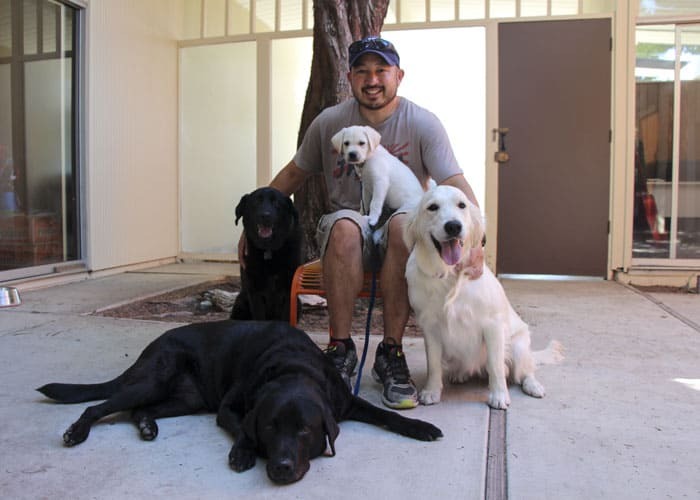 Thank you so much for letting me know about your journey to become a puppy raiser. Please feel free to contact me and let me know if you have any other questions. Your site is very useful for me. I have learned many things from your site. Good luck! Thank you! I’m glad it’s been helpful. Let me know if you have any questions. I’m trying to make sure we keep our five month old bichon/Beagle mixed girl (as my husband is losing his mind with her). We’ve had her for two months. She has to be crated while we work and I come home at lunch to let her out for about an hour. We’ve adjusted the size of the crate like we’ve read about and she pees like crazy there and absolutely hates being in there when we put her there. She also is happy to go outside when we go out and then go again in the house without letting us know she has to pee again. We’re a bit at our wits end. Are we crazy to think after two months of training and at her age that we should expect her to be better? Thank you.